I stopped by The Hole gallery, here in NYC, the other evening right as they were closing, but I did get a chance to quickly peruse Japanese artist Misaki Kawai’s solo exhibit, Hair Show. And hairy it was. 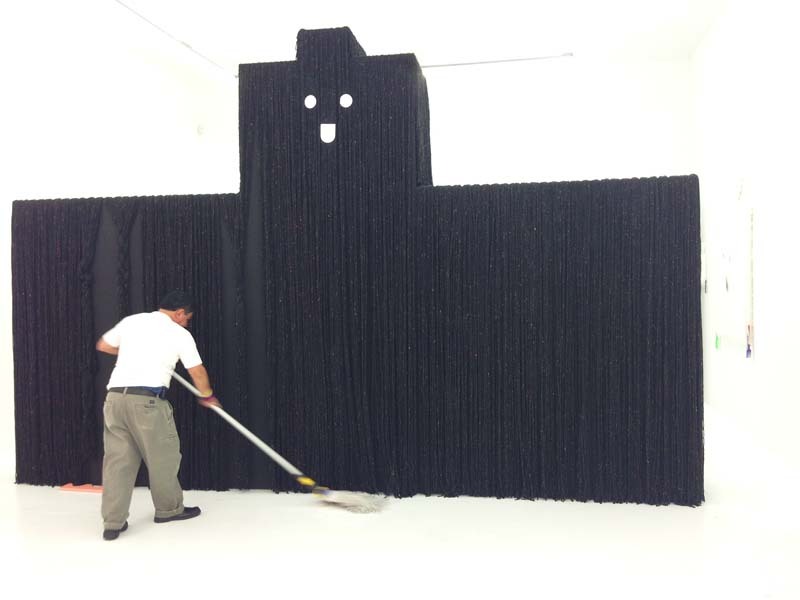 In fact, while I was there, there were three people sweeping hair off the floor throughout the gallery, while one gentleman mopped the very trampled and marked up white floor. Kawai’s humorous, childlike hairy sculptures all come equipped with combs for creature grooming by visitors. The largest piece, Max, stands very tall and wide in the far room, and was apparently inspired by a dog Kawai sees daily on her block. Apart from the playful, geometric hairy creatures, the show also includes large minimalist charcoal canvases by the artist that capture the whimsy that children’s drawings often inhabit, yet somehow gets lost with age. Kawai seems able to genuinely recreate that elusive innocence. Not surprisingly, Misaki Kawai exhibited at The Children’s Museum last year. Her work would put a smile on people of all ages, even her large-boobed bench strategically positioned in the center of the gallery; an ideal vantage point for exhibit viewing. Hair Show will be at The Hole through November 2, 2013. Top photo courtesy of the artist. All others: collabcubed. This entry was posted in Art, Event, Fun, Pop Culture, Stuff We Like. Bookmark the permalink.